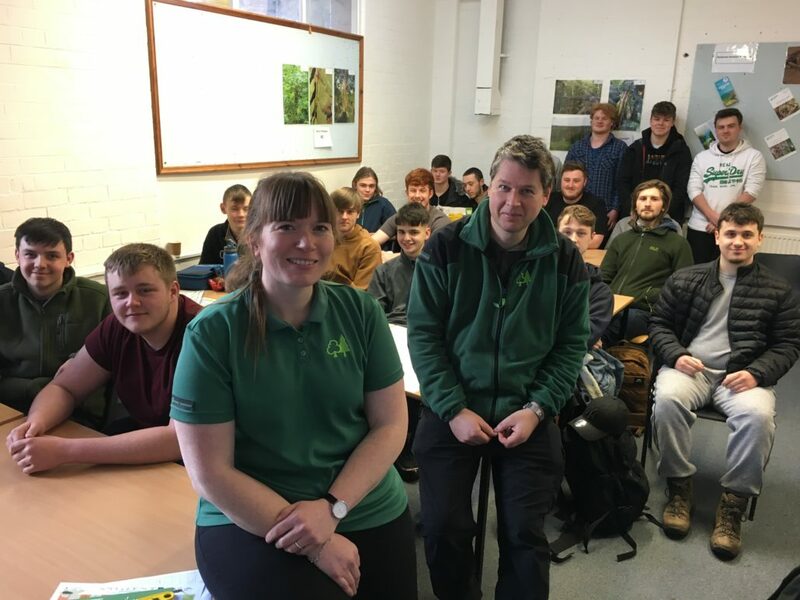 Tree health and biosecurity was the very relevant and current topic for a presentation and workshop delivered to Forestry and Arboriculture students by members of the Forestry Commission England’s Tree Health Team. The informative morning, enjoyed by 25 first and second year students, was thanks to our well established links with industry professionals. The Forestry Commission are among a number of partners who regularly support our programmes with educational presentations and discussions. Under the title ‘Don’t give pests and diseases an easy ride’, Biosecurity Officer Becki Gawthorpe and Tree Health Officer Barnaby Wylder gave a presentation on pests and diseases and signs and symptoms of ill health in trees. They also outlined the Forestry Commission’s current ‘Keep it Clean’ campaign and encouraged students to think about the different ways disease can be spread from tree to tree, particularly by kit and transport which hasn’t been thoroughly cleaned between sites. This was followed by a thought provoking workshop which put our students in the boots of staff and volunteers, contractors and visitors. Said Becki: “The students did exceptionally well and there was a lot of engagement, particularly during the workshop. We are facing a steady increase in pest and disease outbreaks due to a number of factors, including climate change and globalisation. The Forestry Commission’s Tree Health Team will be among industry partners to be represented at our Countryside Industry Information Day on Thursday May 2.